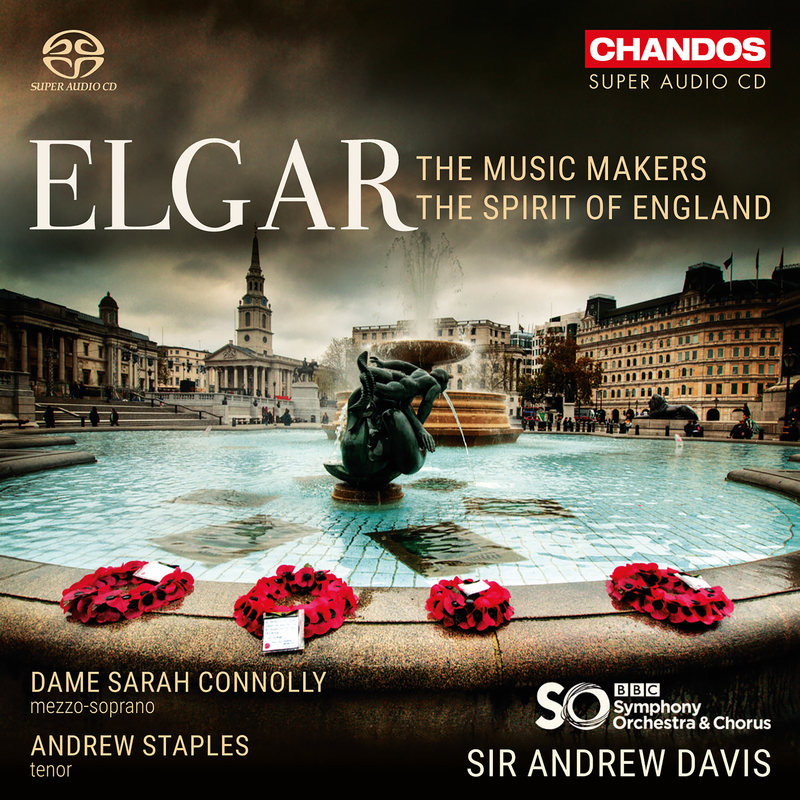 Andrew Davis conducts Elgar The Music Makers and Spirit of England Op 80 with the BBC Symphony Orchestra and Chorus with Sarah Connolly and Andrew Staples for Chandos, juxtaposing Elgar's private and public faces. Elgar's The Music Makers op 69 premiered in July 1912, but had been long in gestation. Elgar knew of Arthur O'Shaughanessy's Ode when he was in his twenties, when he was isolated, scraping a living as teacher, organist and conductor of the very limited orchestra at Powick Asylum, not far from his home, with no obvious prospects. Thirty years later, his status solidly established, might he portray himself in this piece, just as he had portrayed his friends in the Enigma Variations, incorporating references to his own music, not so much for their own sake but because, as he wrote, they expressed "my sense of the loneliness of the artist". Despite his success and acclaim, Elgar identified creativity with alienation. Artists are "dreamers of dreams, Wandering by lone sea-breakers, And sitting by desolate streams; World-losers and world-forsakers, On whom the pale moon gleams". The slow orchestral introduction gives way to a more forceful section, where the chorus bursts forth "One man with a dream, at pleasure. Shall go forth and conquer a crown; And three with a new song's measure Can trample a kingdom down." The orchestra surges in full flow, but animato fades to più lento. Only halfway through does the contralto (Sarah Connolly) emerge, heralded by harps. "They had no vision amazing.....no divine foreshowing Of the land to which they are going:" The music makers proceed towards uncharted territory with calm assurance. Yet again, tranquility gives way to con fuoco and back to lento. Ironically, it is the chorus, not the soloist who sing of "dreaming and singing, A little apart from ye." as if isolation is still too uncomfortable to sing about without ensemble, despite the confident crashing chords in the orchestra and raised voices. A quiet transition to the finale, when the mood rises again, Connolly singing forcefully. "Great hail! " The artist shall "teach us your song's new numbers; And things that we dreamed not before: Yea, in spite of a dreamer who slumbers, And a singer who sings no more." Though the soloist fades to stillness, the chorus continues to hold the line. Elgar's Spirit of England op. 80 (1915-17) is so powerful that it draws you into its glorious self confidence even though we now know where jingoistic bluster can lead. But for a moment we are spellbound by the sheer extravagance of the piece. Drums roll, strings surge and the BBC Symphony Chorus explode. Andrew Staples's voice rises heroically above the wall of sound. "Spirit of England, go before us !" 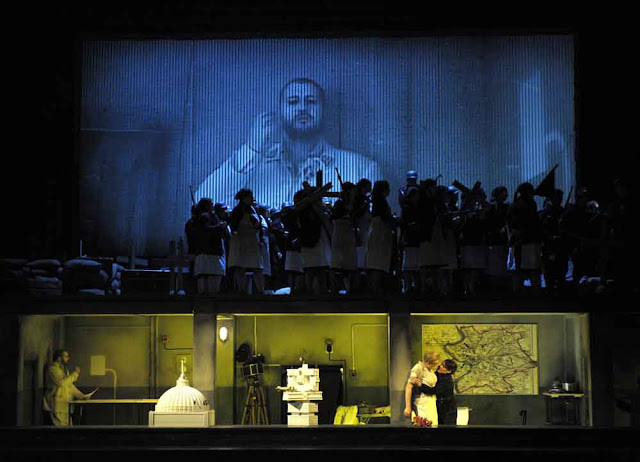 The orchestral writing sets a pulse which supports the chorus, where male and female voices sing alternating lines. This creates an interflow suggesting vast, turbulent forces. Staples shaped the magnificent line "We step from days/ of sour divison/ into the grandeur of our Fate", each key word meticulously articulated, the last word "Fate" ringing out like a clarion. Staples’s enunciation was sharp, consonants crisp, much more idiomatic than the other three tenors I've heard in this piece in recent years. The English tenor style, at its best, brings out the edge in the language hinting at hidden undercurrents : what really is the unshakeable soul of "divinely suffering man"? This does matter, since Elgar may well have seen the circumstances more acutely than did the populist poet. A male voice captures an edge of anguish and pain, while female voices express the more conventional Boadicea approach. In contrast to the first section "The Fourth of August", the second section "To Women" is more restrained. While the tenor line was integrated with chorus and orchestra, it now stands almost alone. Phrases like "like a flame" and "boundless night" fly upward from the line, Staples emphasizing them with flourish. A melancholy violin passage introduces a much darker mood. "For the Fallen" is a funeral procession but proceeds forward with relentless surge, Davis marking the throbbing undertow in the orchestra. The choral line with its clipped, almost staccato tension, evoked, perhaps gunfire. The woodwind figure, followed by low-timbred strings, was particularly moving. "We shall remember them", sang Staples, his voice carrying above the chorus and orchestra. "To the end, to the end, they remain".